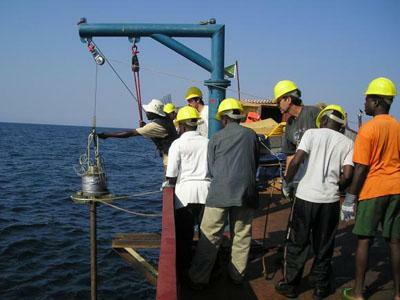 James Russell (left of the blue post) and his team take core samples from Lake Tanganyika. A dramatic increase in rainfall at the end of the last ice age marked the beginning of the African Humid Period. Researchers using complex modeling systems have figured out the forces that drove that transition, including an important role for greenhouse gasses. Prof. Jim Russell was a co-author of a study published in Science. He discussed his findings and their implications with Kevin Stacey.